Clue two for The Patriot mystery was easy to complete - twelve rail fence blocks. I pulled the red strips from my 2.5 inch scrap bin and cut the white from yardage. The blocks were trimmed to 9.5 inches. The clues for this Mystery for the Military are released weekly on Wednesdays. I had some time last week to work on first clue for the Square Dance mystery. Clue #1 (56 nine-patch blocks) is complete and "in the box." 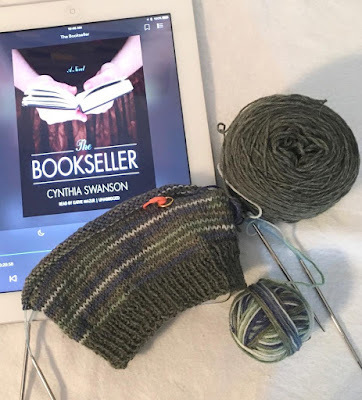 A stack of baby hats knit with wool, sock yarn scraps was mailed to Brenda A. in Nampa, ID today, and they will eventually be sent to the Rankin Inuit Birthing Center in Alaska. 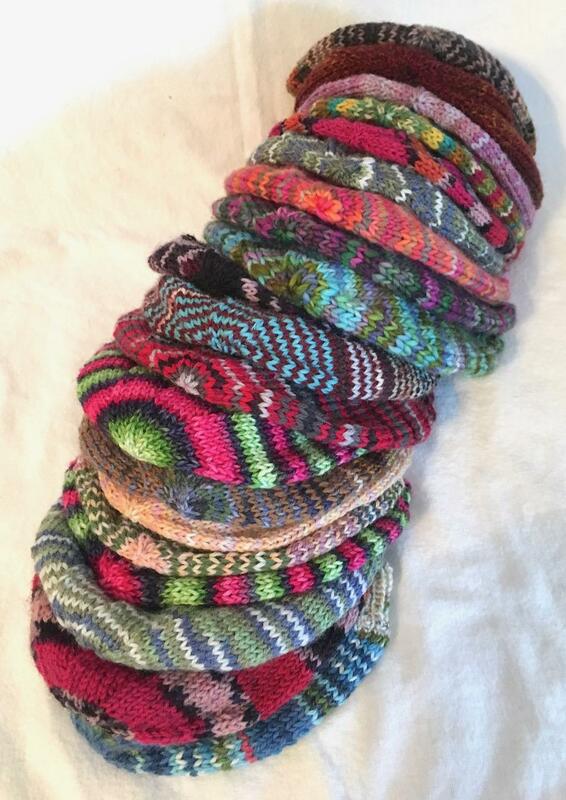 Since the hats are knit with wool, they are not accepted at regular hospitals. Some of the scrap yarn came from Cheryl O., some from the donation box at the senior center, and some from my own stash. I find it rewarding and satisfying to turn the odd bits of yarn into hats for the babies. If only it were this easy . 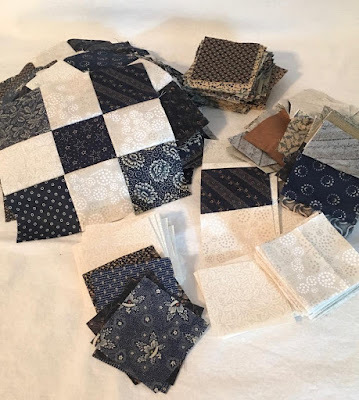 . .
Clue #1 for the Square Dance mystery QAL was released last week. In between errands and appointments, I made some progress on the clue. All the 2.5 inch squares I cut for the mystery will be used for this first clue to make 56 nine-patch blocks. I have 20 completed blocks, so I have a lot more sewing to do before this clue is finished. The next clue will not be released until March, so I do not have to rush. I'm only a few chapters into The Bookseller, but I can tell this is going to be a good book. Have you read it? Two of the books (67 Shots and Madam President) are non-fiction. I had forgotten a lot about the Kent State shooting, and 67 Shots jogged my memory of that turbulent time in our nation's history. I learned details that were not available at the time, details that set the stage for this tragedy. Madam President opened my eyes to another historical event: our nation's first female President. Woodrow Wilson's wife Edith took on the executive role after her husband's debilitating stroke while he was in office. On physician's orders, she limited access to the President and to protect his health, and she became a liaison between the President and his advisors. Technically, Edith Wilson was President for 18 months. It was a fascinating book, and I strongly doubt that anything like this could happen in today's society. On the knitting front, the stack of scrap, sock yarn hats is growing, and I'll probably send a package of hats to the project coordinator this week. I love using bits and dabs of yarn to knit helical strips. The first clue for the Mystery Quilts for the Military quilt along (QAL), The Patriot, was released last week and resulted in sixteen, 9.5 inch wonky star blocks. Making stars with wonky points was fun and something I hadn't tried before. 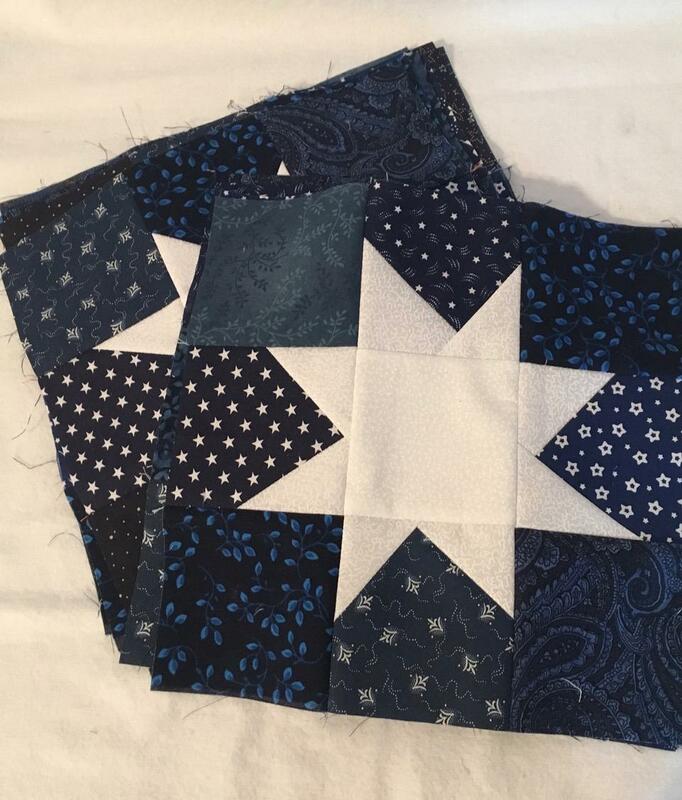 I used yardage for the stars, but the dark blue squares were pulled from 3.5 inch scrap bin. Want to join in the fun? The clues will be posted on Alycia Quilts. Shoo Fly used the last of the eagle napkins, so I can officially cross them off of my UFO challenge sheet. I considered making individual quilts with the final four napkins, but I was growing weary of working with them. I'm sure you are getting tired of seeing them, too. 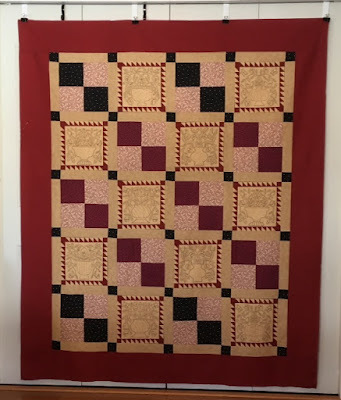 I do like how the outside design on the napkins creates a secondary pattern around the center burgundy block, made from fabric donated by Judy. 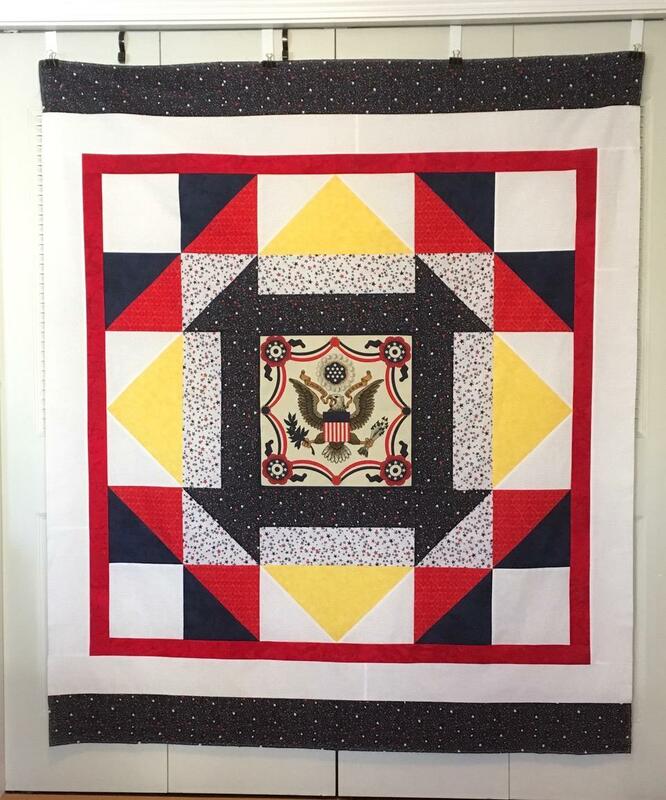 The red border was also some yardage from Judy. 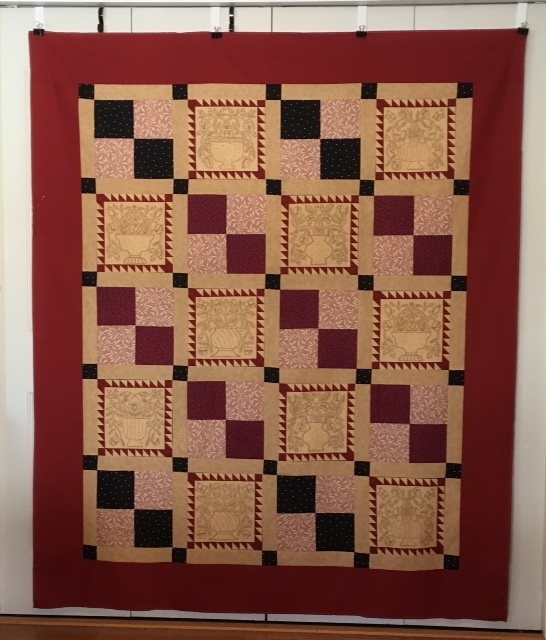 This quilt is named for the huge "shoo fly" block in the center. Some of my most helpful tools are made from ordinary items. 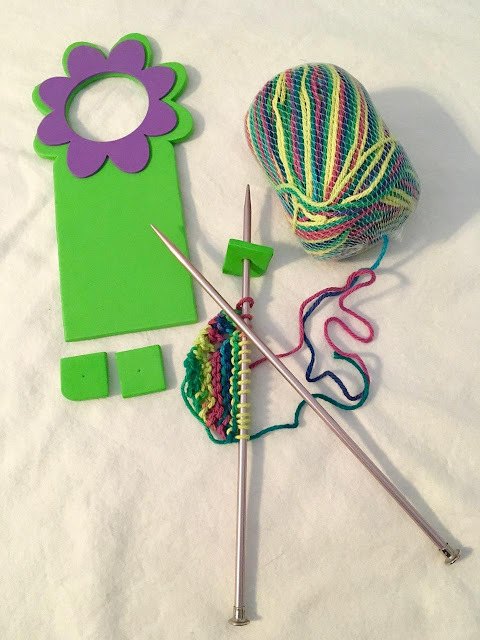 For example, I make stitch stoppers for my knitting needles from a simple foam door hanger, sold in packs of four at the Dollar Store. I snip off about an inch, cut that strip into three sections and poke a hole in the middle with a sturdy tapestry needle. One door hanger produces a dozen of these handy squares - more if you cut them smaller. 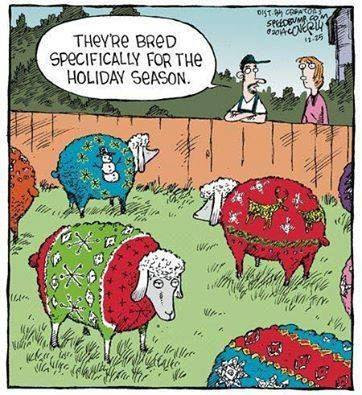 These were especially helpful when I was knitting traveling blankets for the Oddball Baby Blanket group. They work better than tip protectors because they do not fall off easily. I usually toss some in my knitting bag, and I don't mind sharing the protectors with friends because they are so inexpensive to "make." Several years ago, my mom told me this photo was taken in December 1938 before or after her mother's funeral. 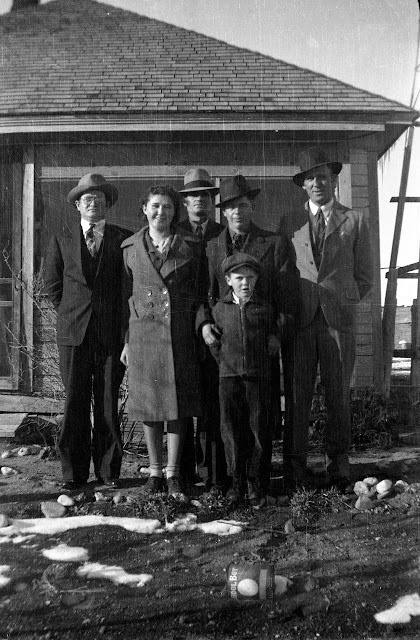 My oldest brother John shown in the front would have been about six at the time. 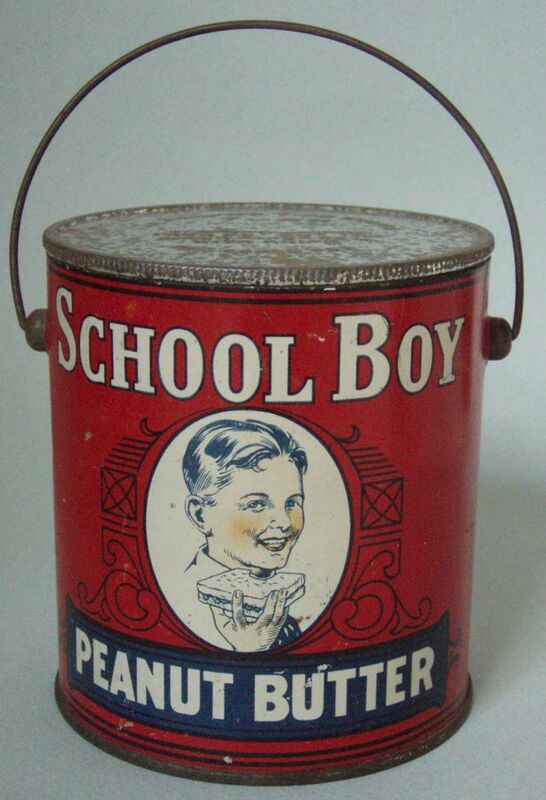 The can in the foreground caught my eye, and a quick Google search revealed it is a School Boy peanut butter tin. 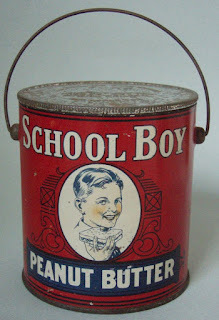 I wonder how many of these cans were used for lunch pails over the years? 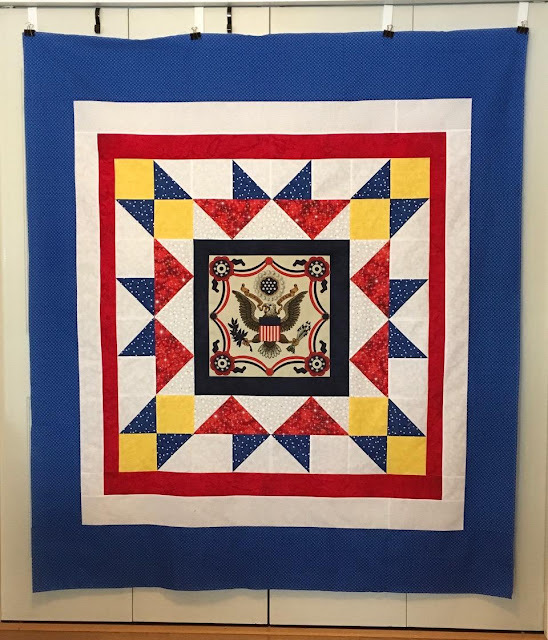 The center of Super Moon is one of the patriotic napkins I purchased at a quilt silent auction in 2017. This quilt was named for the red, super moon that appeared January 31, 2018. 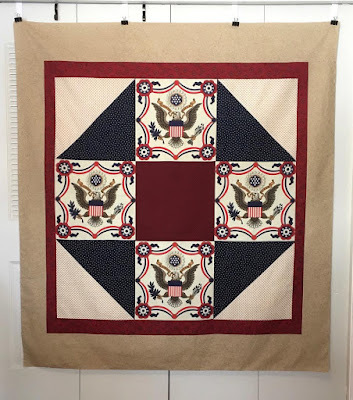 One of my UFO challenge goals for this month is to make Quilts of Valor from the napkins. Super Moon is the second quilt made this month with the napkins. About ten years ago, Brenda gave me this quilter's calculator for Christmas. At the time, I wasn't making that many quilts and didn't think I've ever use it. 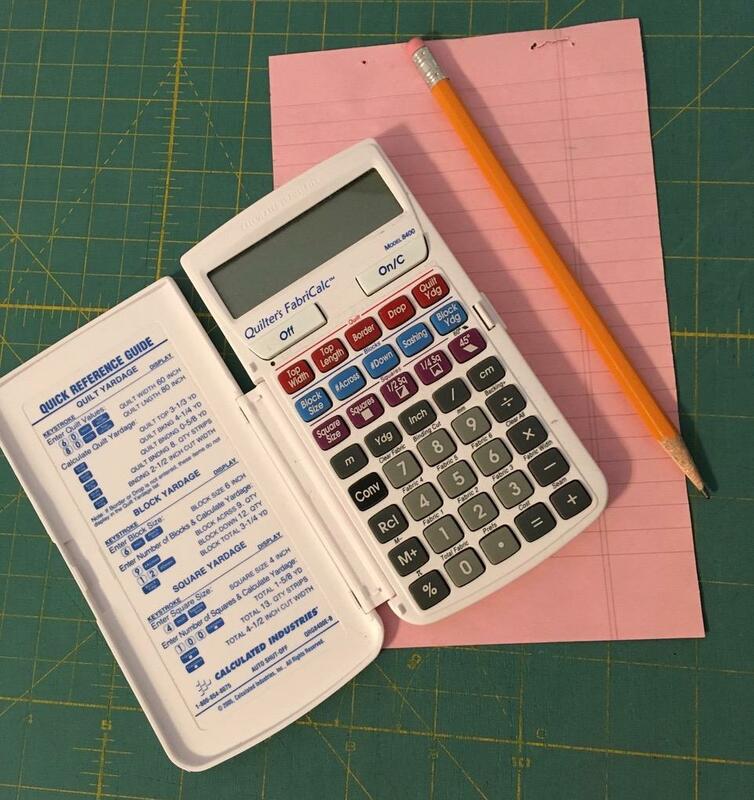 Fast forward a few years, and the calculator has become invaluable, as I am constantly using it to determine yardage and the required number of strips to cut for borders. Thanks again, Brenda for this useful gift. My dad and mom started selling milk commercially in 1957 to the Morning Star Dairy based in Riverton, WY. Note that the driver is holding milk cans. The cows were milked in a two stanchion barn. 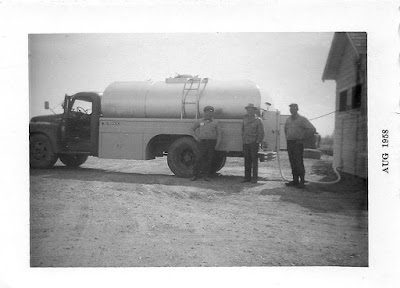 A new barn was built in 1963 with six stanchions (three on each side) and the a glass pipeline from the stanchions to the large refrigerated, stainless steel, bulk milk tank that held hundreds of gallons of raw milk. Later, another bulk tank was added to the barn and was used occasionally. 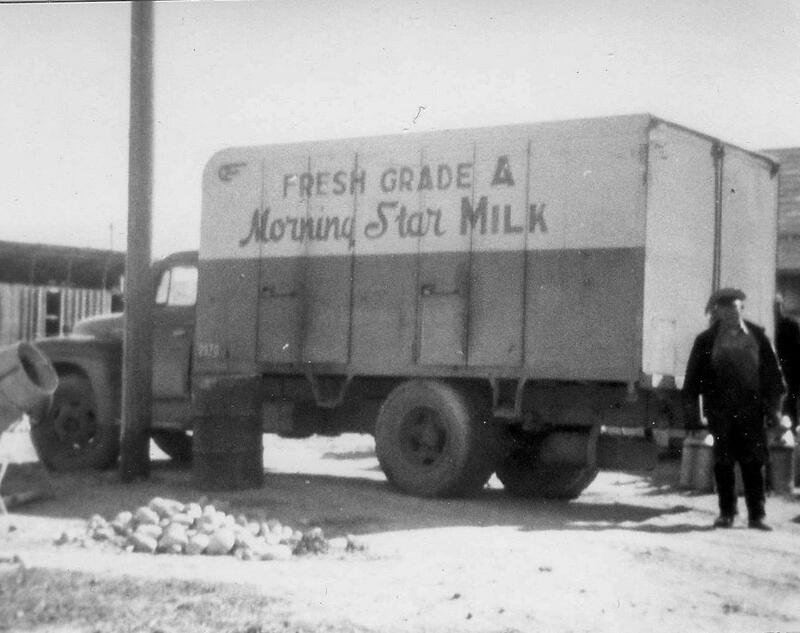 In the mid-1960s, the dairy farmers joined the Mountain Empire Dairy Association (MEDA) and the milk was trucked to Denver, Colorado for processing. When I was growing up, there were ten dairies within a ten mile radius. Gradually, the cost of trucking became too expensive, and one by one the dairy herds were sold. My dad died in 1966, and my mom and brother (Rich) continued to milk. My mom died in 1989, and Rich continued to milk. When Rich died in 1996, the cows were sold. 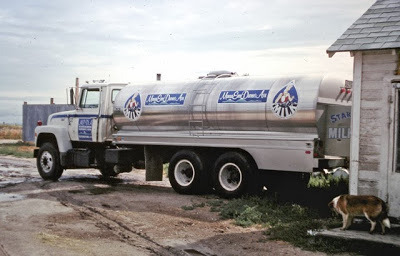 My family was in the dairy business for nearly forty years. Earlier posts about the milk trucks can be seen here and here. 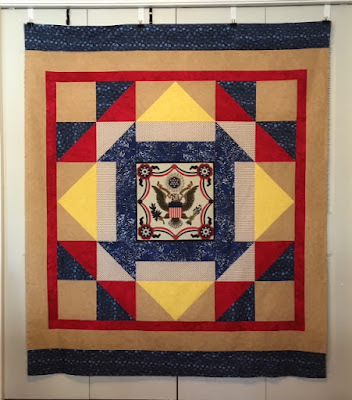 Saturday, February 3, 2018 was the national Quilt of Valor Sew Day. The local QOV group scheduled a sew-in at a local church, but I decided to stay home and work. I finished American Spirit (shown in yesterday's post) and prepared a kit (shown above) for another QOV, using the same pattern. The Flannel Roses pattern requires a 16.5 inch center, so I'm adding a narrow, navy frame on the napkin to bring it up to size. Since I was on a roll and in the mood to cut fabric, I prepared a kit. 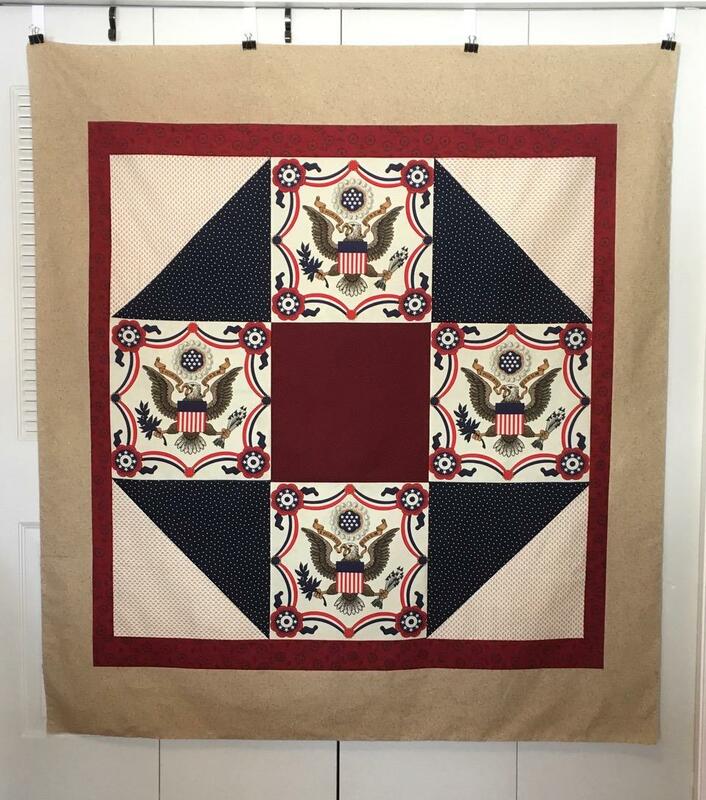 The pattern I selected for this QOV uses smaller pieces, but one of the patriotic napkins will still be in the center. 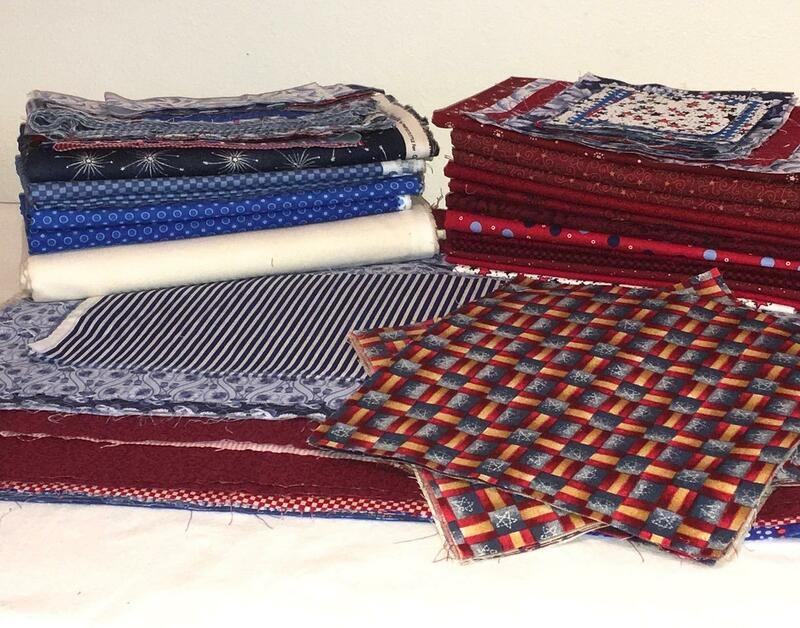 February's UFO challenge goal is to use as many of the patriotic napkins as I can to make Quilts of Valor. 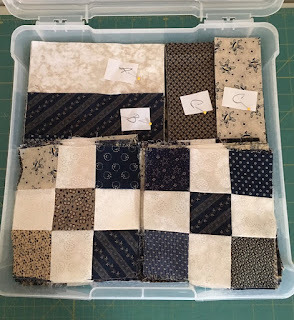 The blocks with the sawtooth borders are from a fabric panel that has been in my stash for a few years. I like how the HSTs create a secondary pattern. Hopefully this simple quilt will appeal to a female veteran. 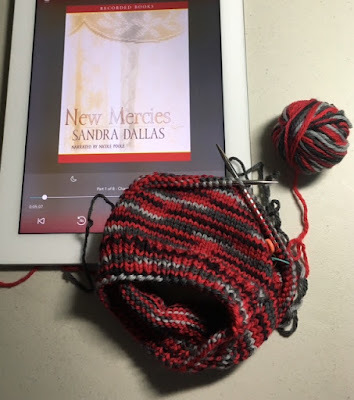 The OverDrive App on my iPad is a great knitting/sewing companion. It is easy to download audio books, and the time I spend knitting and sewing flies by. I'm able to get more done when my mind and my hands are occupied. OverDrive is associated with my local library, and my library card allows me to check out the books for 14 days. The App works on my phone and my iPad and the two devices sync to keep my place in the recording. I can checkout ebooks, audio books and videos with the OverDrive App. Does your public library give you access to audio books via an App?